We're a bit fixed on frogs in our house at the moment. 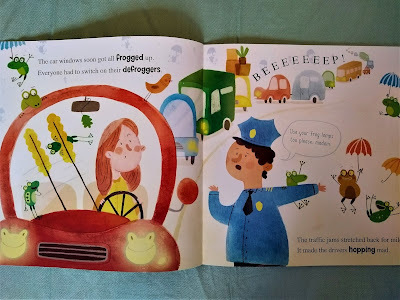 Toddler used to say 'bob' instead of 'frog' which I think we can all agree is adorable so we'd find any excuse to get him to say it! Sadly he's now moved onto 'bog' but does sometimes accompany it with an enthusiastic 'ribbip!' and an inept but cute attempt to frog-leap, so we still like to point out frogs to him. As you can imagine, I was pretty excited when Maverick Children's Books sent us a copy of their new picture book 'Froggy Day' to review! 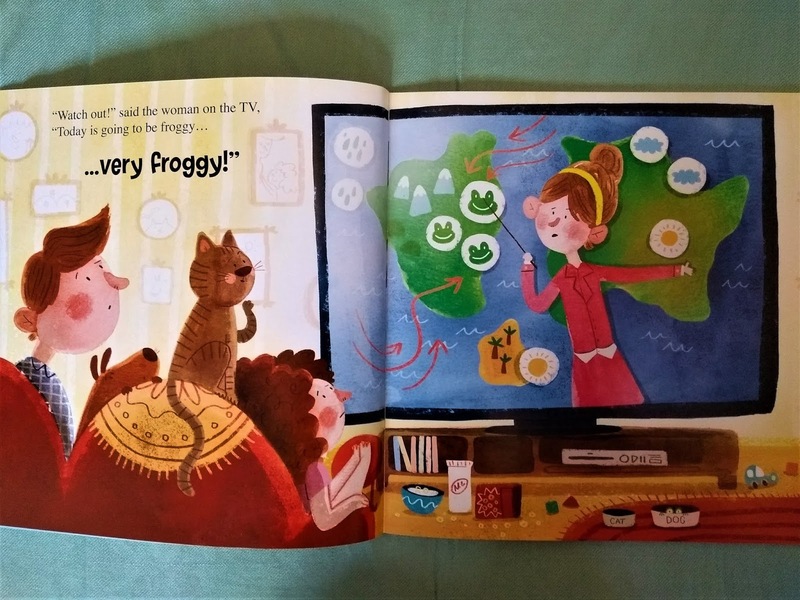 As you can imagine this book features A LOT of frogs! One day the weather presenter on TV gives a very unusual forecast - it's going to be a froggy day! Before long, everywhere is teeming with frogs; the supermarket, the school, the building site and more. Chaos descends but the children love it! This book is an absolute joy to read aloud. 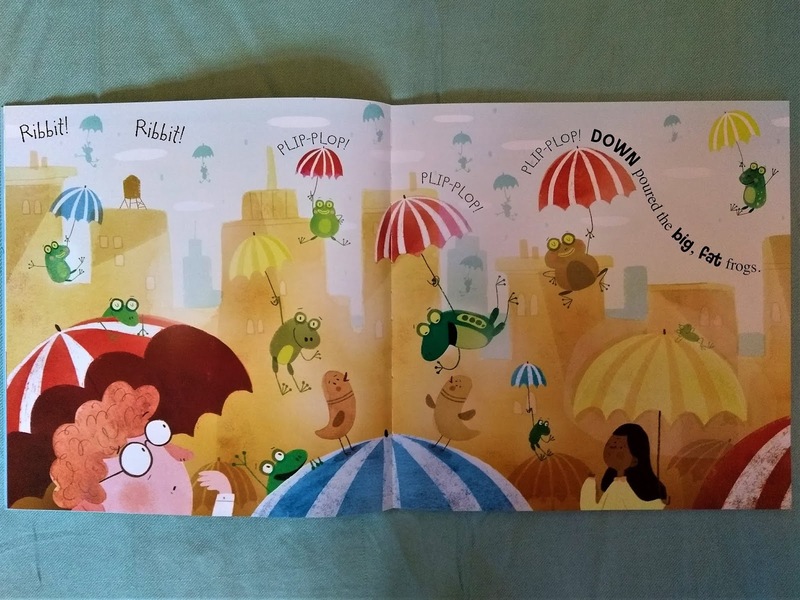 It's silly, it's funny, and it's packed with brilliant onomatopoeias to get little ones giggling! There's lots of word play too, which I personally really enjoy and can also be appreciated by preschoolers and young school age children who are just starting to understand puns. My six year old, who pretends to be too old for picture books, said it was really funny and, "the best picture book ever!" I love the bright, bold illustrations. I first came across Barbara Bakos's work in the fantastic 'Rooster Wore Skinny Jeans' and there are echoes of that book on one spread set in a farm which made me smile. I really love her quirky, humorous style and I think there is a lot of fun to be had trying to count all the frogs and spot what they're getting up to in each picture. 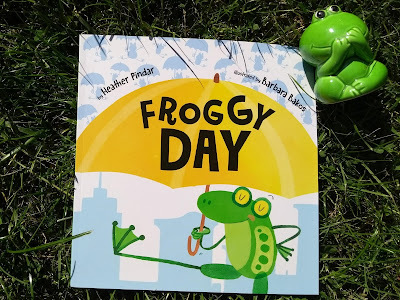 This is a really fun and quirky book, great for sharing with toddlers and preschoolers and making them giggle, and a must for any little frog lover! 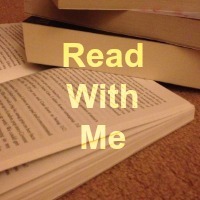 DISCLAIMER: I was provided with this book for the purposes of this review but all words and opinions are my own. This looks like a really fun book and what a great recommendation from your daughter! It's so sad when little ones stop saying their own cute words for things and learn the real ones, hope you recorded him!